A porron is a kind of pitcher used in Spain to serve and drink wine. A porron is a very old, traditional way to store wine, as well as to share wine with a group of people. 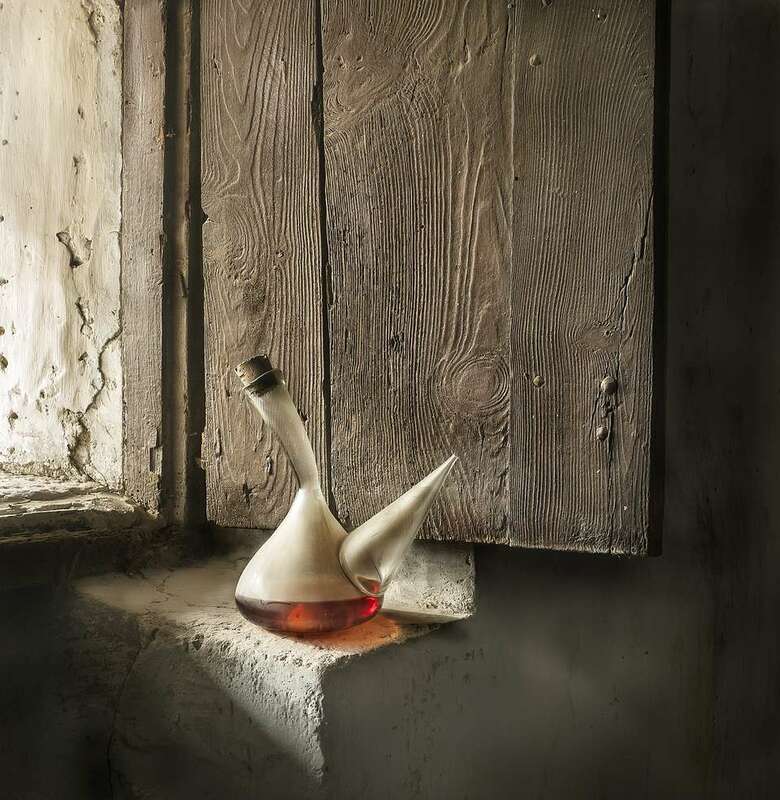 Porrones can be glass or ceramic and keep exposure to the air to a minimum, and generally, hold about .75 liter (roughly the same as a standard bottle of wine). They are wide at the bottom and have a long, thin neck and usually are fit with corks, or plastic caps. Toward the bottom is a long conical-shaped spout, narrowing to a small opening at the tip. Wash the porron thoroughly before using. Pour enough wine in the wide bottom to fill it. Place cap on top. To practice drinking from a porron, use water. Red wine stains are sometimes difficult to remove. When practicing with wine, wear a plastic bib or tuck a kitchen towel into your shirt to protect your clothing from wine stains. Don't touch the spout to your lips. Hold the porron in front of you at or a little below the chest. Hold the neck with one hand, elbow bent. Make sure that the spout is facing you! While holding your hand around the neck of the porron, lift with one hand, so the spout is just above your mouth. Hold the porron a few inches from your lips. Tilt your head back, with your mouth open, and tip the porron toward you. Some people jut their jaw forward slightly to help catch the wine. Once you are comfortable drinking out of the porron without spilling all over the front of you, try extending your arm slightly above you for a longer flow. To stop the flow, bend your arm and lower the porron as you right it. Keep your mouth open to catch any drops of wine. Now you are ready to pass it to the next drinker. Don't worry if you spill the first few times you use a porron, every beginner does! After all, the Spaniards you see drinking from porrones who don't spill have probably had years of practice!